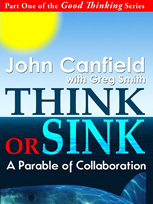 The core of John’s work is around Leadership Development, and specifically Collaboration Skills. There are few (any?) other leadership speakers or authors who support collaboration skills the way John does. The big difference in John’s work is helping company leaders learn how to work with conflict constructively. John teaches audiences to think of conflict as a manageable and a surprisingly desirable advantage. When conflict is thought of as indication that options are present, and not just nasty interpersonal skirmishes, leaders then can learn to manage the options available when conflict exists. Having options is a good thing. Learning to work with options impersonally and deliberately can help teams actively work to eliminate their frequent dysfunction. Without collaboration, someone often “wins”, while others “lose”. With productive collaboration, the best ideas win. John’s four-part Good Thinking Series (available on Amazon) presents solid strategies and tools to improve an organization’s performance by deliberately supporting more effective thinking with all leaders and employees. Topics include collaboration skills, problem solving, creative thinking skills, strategic planning, and scenario planning. Please see John’s Topic Summaries. 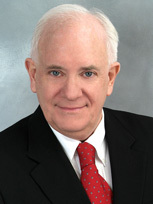 His clients include Citibank, Deloitte, Herman Miller, Honeywell, Intel, Johnson Controls, Mellon Financial Services, NASA, Prudential, and Sandia National Laboratories, and thousands of participants of his many seminars and keynote speeches presented in North and South America, Europe, Africa, and Asia. John has earned a B.S. in Mechanical & Industrial Engineering from the University of Minnesota and a B.A. in Political Science and Psychology from Williams College. Prior to 1990 John was a Senior Engineering Manager for Intel Corporation and later Director of Corporate Quality and Design Research for Herman Miller.